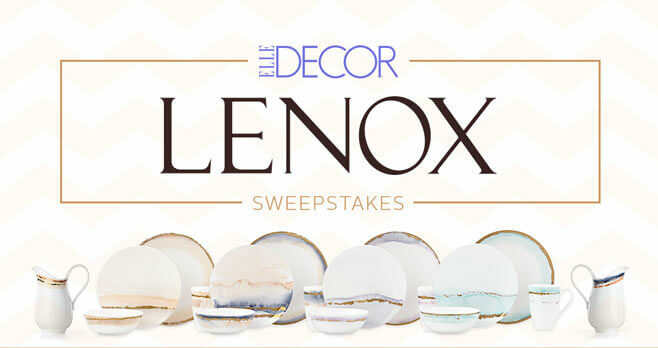 Enter the ELLE DECOR Lenox Sweepstakes by September 3, 2018 and you could win 10, four-piece place settings from any of the 4 Season’s Radiance patterns available (Fall, Summer, Winter, Spring) from Lenox. Eligibility: The ELLE DECOR Lenox Sweepstakes is open to legal residents of the 48 contiguous United States and the District of Columbia, who have reached the age of 18 or older in their state or territory of residence at time of entry. Promotion Period: The Sweepstakes begins July 31, 2018, at 12:01 A.M. (ET) through September 3, 2018, at 11:59 P.M. (ET). Prize(s): The grand prize consists of ten (10) 4-piece place settings (choice of any 4 Season’s Radiance patterns: Winter, Spring, Summer or Fall), one (1) matching platter, one (1) serving bowl, and one (1) pitcher. ELLE DECOR Sweepstakes 2018 – I loved your beautiful LENOX tablescape featured in the September 2018 issue of ELLE DECOR. Magnifique!